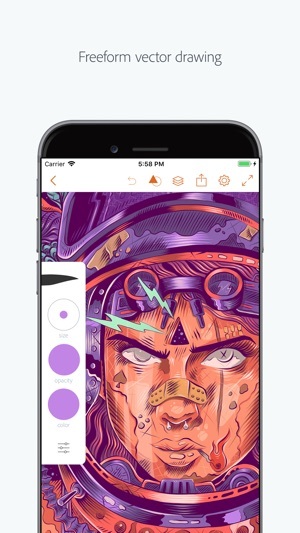 If you’re a vector artist, Adobe Draw is your go-to app for digital drawing. Use customizable brushes to draw, design, and style your art. We’ve included basic shape stencils to speed up your design work— like circles, squares, French curves, polygons, and even speech bubbles for comics. Create on resizable canvases up to a delightfully printable 8k. 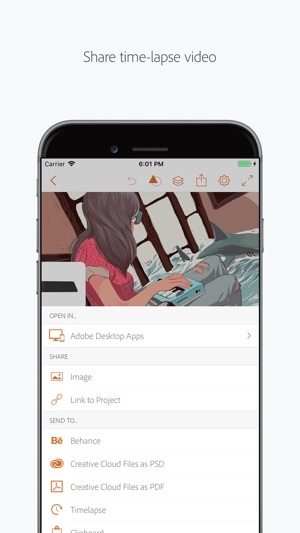 With one tap, your layered files are sent right to Adobe Illustrator CC, or as a flat image to Adobe Photoshop CC. Show off your drawing process with an automatically created time-lapse video. 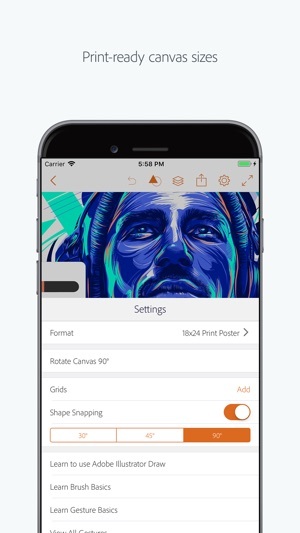 Use of Adobe mobile apps and online services requires registration for a free Adobe ID as part of a free, basic level of Creative Cloud membership. Adobe online services require an Internet connection, are not available in all countries or languages, and may be subject to change or discontinuation without notice. 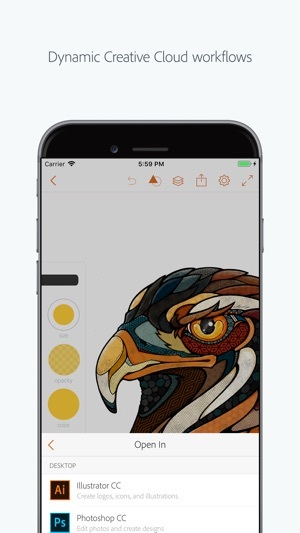 If you enjoy using Adobe Draw, please leave a review. It really helps! As far as the quality and ease of use, this app takes the cake. I’ve struggled to get into digital art because the apps are usually so unfriendly to users, but simplicity and easy to follow tutorials really helped with this app. There’s not a lot of tool options, but they’re all the tool types that I really need. Plus the fact it easily converts to a timelapse is a awesome plus. However, I am sad to say I’m currently looking for a different app as I quickly outgrew my use for this one. 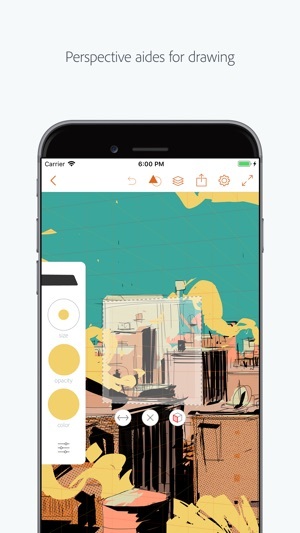 If all you plan to do is sketch something quick, this is the app for you. But any real project worth time and effort causes awful lag. I have my iPad Pro up to date, as well as the app, but my larger projects just can’t be supported by the functions of the app. Sometimes it’s a few second delay for a single line to show, opening and closing layers takes ten seconds to load, the fact that if you forget to “convert to timelapse” every few minutes then it will never load, or the zooming/rotating taking another ten seconds to load. It’s bad enough I don’t want anything more to do with this app anymore. Additionally, I’ve learned to work around the lack of a smudge or blur tool, but there are lots of times it would really be perfect for the looks I’m trying to create. I use this app non stop. This is my 5th year I think? It’s come a long way and I love it. The time lapse feature is amazing for tutorials. I want to give this 5 stars but two things are holding it back. I’d like to be able to fuzz the edges of my brush. And I’d love to be able to consolidate stokes into one shape. The reason for this is when I upload the work into the desktop illustrator, it is labeled a “draw layer” and each stroke is its own shape. This makes it very difficult to add finishing touches like gradients etc. strange since the ability to finish projects in illustrator is part of the advertising. I suspect there might already be a fix for it. But the complete lack of tutorials on adobe learn or the forums makes it hard to guess what that might be. Not being able to edit draw layers in the main illustrator is really hurting my workflow. To the point where if it’s a serious project, or one I might need several versions of, I don’t use adobe draw at all. Which is a real shame because it’s nicer to use than the blob brush. I’ve been using this app for about a week now, and I have to say, after growing accustomed to the layout and gestures, I’d really been enjoying it. I made some stuff I was really happy with, and if all had stayed as it was, this would be a 5 star review. However, a few days ago, the app gradually started to have issues, in that it began freezing up every 10 seconds or so, for about 3 seconds every time. To be clear, I have a new iPhone 8 and a new iPad both of which are having this issue. It does it even when you’re doing absolutely nothing in the app, or when you’re drawing, or resizing or pulling up a menu. It just happens inconsistently, and for seemingly no reason. I’ve looked it up online, emailed adobe, and even gone as far as deleting all but 6 simple pieces of my art and bought extra memory for a small price each month. Nothing has improved the problem, I haven’t had a response yet from adobe, and it makes it nearly impossible to complete anything unless you’re content with the program stopping you half way through your pen strokes to have a think every so often. Extremely frustrated and disappointed.